Susan is featured on the cover (and inside) of the Summer issue of Belle Armoire Jewelry/2017. Also see more of her work in the Fall and Winter, 2016 and the Soring, 2017 issues of Belle Armoire Jewelry magazine too! 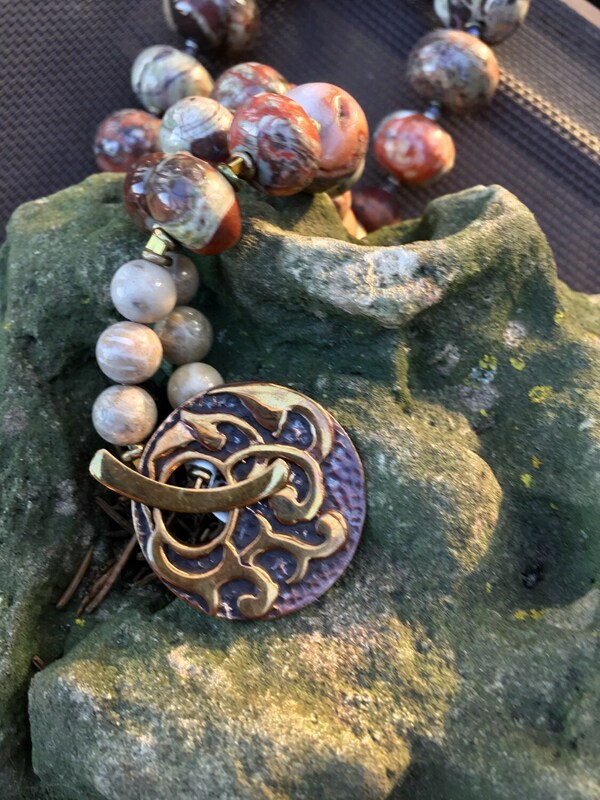 OOAK This JACKSON HOLE statement necklace contains YAZ raku' beads, a graduated set of hand polished lace agate beads and Swarovski tiny bicones crystals between vintage brass disk findings. 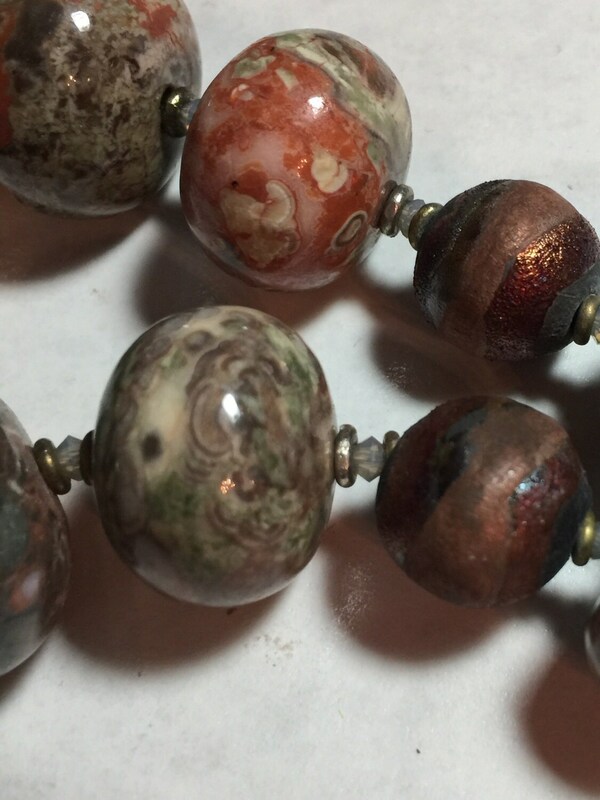 The 1" focal is followed by 12 smaller and smaller lace agates and two raku' beads per side. The beads range from Payne's grey, raw umber, burnt sienna, mossy greens to a soft beige hue sometimes turning ever so slightly a pale pink. It is so reminiscent of the Wyoming landscape at sunset. The 1 1/4" toggle clasp, made by Saki, is bronze with patina for age. The necklace measures approximately 11" on each side with a closed toggle clasp. 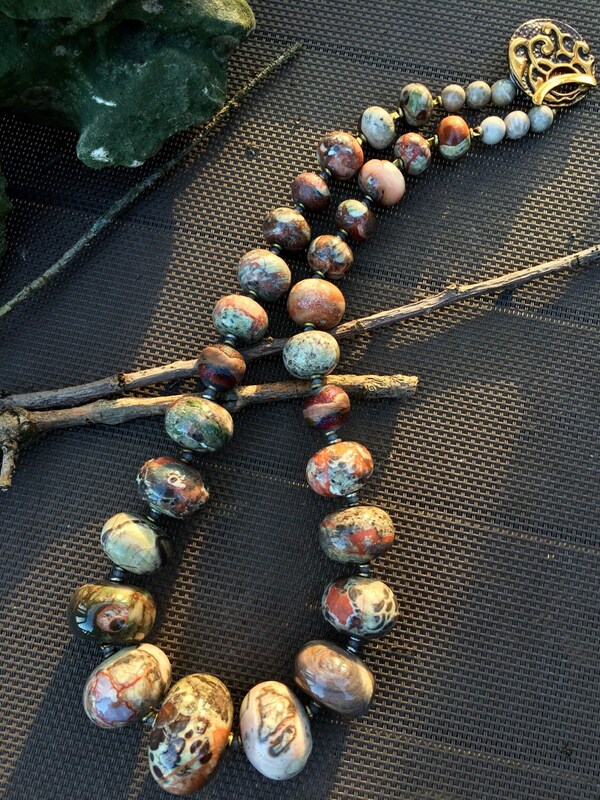 Total necklace is then 22". This is definitely a STATEMENT necklace with the size and weight to prove it. Free insured shipping in the continental United States. Susan Ray, author of Beaded Jewelry: The Complete Guide, Organic Beaded Jewelry, Art and Soul of Glass Beads, Wire Jewelry Workshop and as well as her best seller: Easy Beaded Jewelry (written with her best friend, Sue Wilke), offers techniques and tricks to teach and inspire you to create your own designs. (Ask about purchasing a signed copy at checkout). 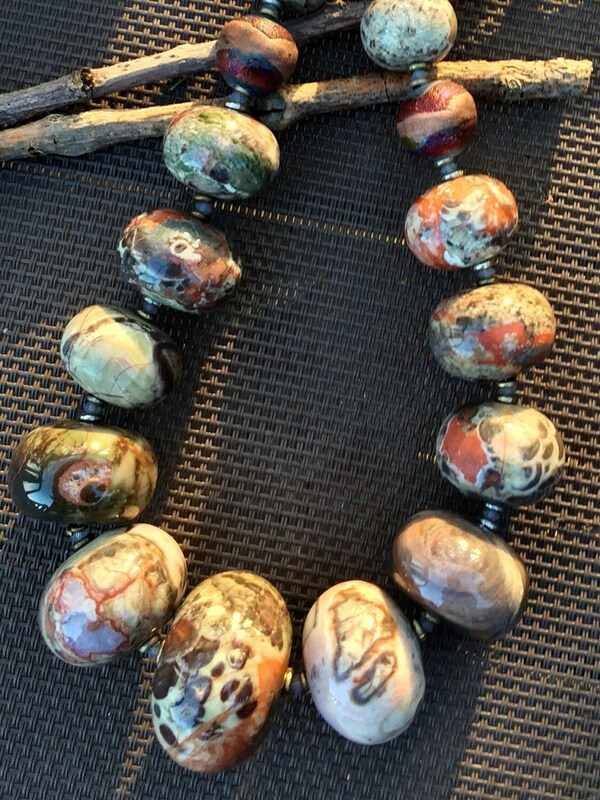 "My love of beads began more than 17 years ago. 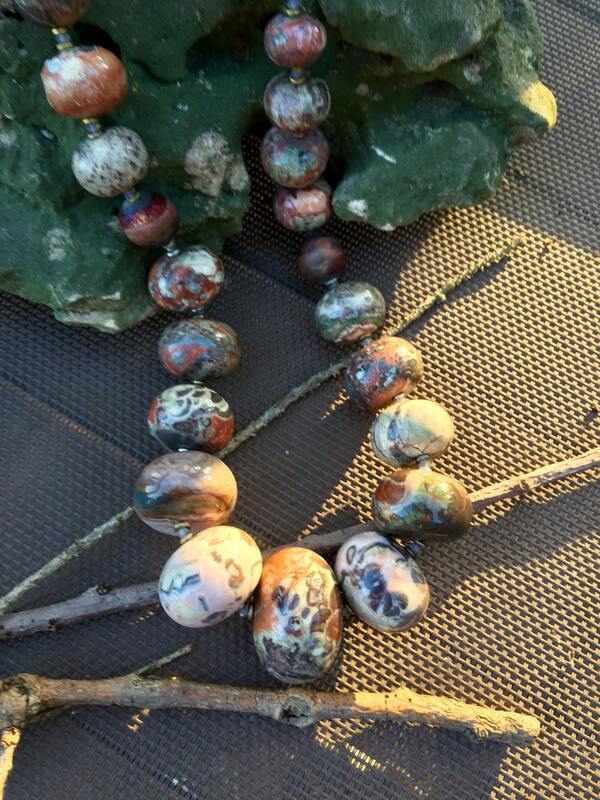 I am fascinated by the human story beads tell, the nature of the beads, the hands that created and traded them. This has led me from my early discovery of the vast history available and the opportunity to learn the skills required to create beautiful jewelry myself. I later opened the first bead store in Galena, Illinois and taught more than 20,000 women (and a few men) to bead. As my knowledge grew I wanted to share it further and wrote five books about beading for the craft industry and have been published many times in numerous national magazines. Along the way I have made many dear and talented friends and have been fortunate to be inspired by many leading designers. We want you to know that the piece of jewelry you have chosen here has never been worn by anyone else, so we do not accept returns or give refunds on jewelry purchases.